An unfortunate reality of life in 2015 is that mainstream media companies have a monopoly on storytelling, crippling communities’ ability to form their own narratives and spreading harmful stereotypes. This damage is felt in the community where IMAN operates, where young black and brown men are often assumed to be lifelong criminals. Muslims across the country are profiled and harassed in similar ways. IMAN works to empower local high schoolers through Digital Media Masters (DMM), a 6-week summer intensive where students become agents of change by projecting their own authentic narratives with the long-term goal of using mass media to transform their communities. Through funding from After School Matters, IMAN was not only able pay the teens for their reporting, but also hire a brilliant instructor, Tariq Weaver, to facilitate thought-provoking conversations with these amazing young minds. One of the most transformative aspects of DMM was the chance for the students to engage with both IMAN’s proven organizing model, and the diverse constituent base of various ethnicities and faith traditions. DMM students participated in programs such as Refresh the ‘Hood, Ramadan Reflections and Fresh Beats & Eats Farmers’ Market. Valued IMAN allies also stepped in to share wisdom and reporting tips. Enoch Muhammad of Hip Hop Detoxx held a Q&A session, and longtime IMAN supporters Ayesha Kazi and Dr. Emad Rahim gave advice on academic and professional success. At the end of the DMM program, students shared their final projects—ranging from photo essays to video interviews—with parents and IMAN staff. Thanks to all those who played a part in making this summer special, and stay on the lookout for articles from the DMM graduates! 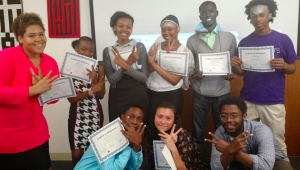 This entry was posted in News, One Chicago, Uncategorized, Youth Services by Sadia Nawab. Bookmark the permalink.